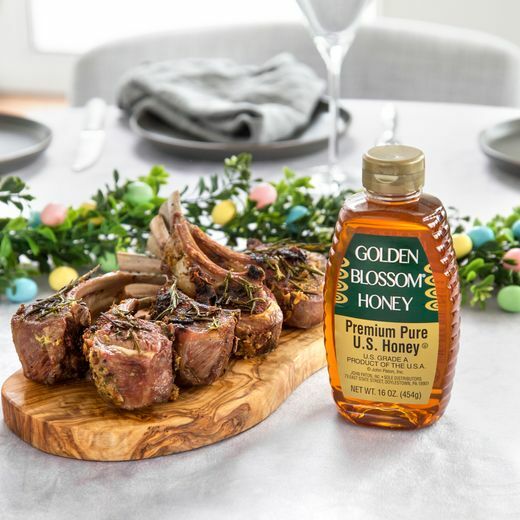 Golden Blossom Honey - Recipes for cooking and baking with Premium Pure U.S. Honey. You will be surprised how easy it is to prepare this elegant rack of lamb; perfect for Easter Sunday. Combine first three ingredients in a bowl. In another bowl, mix together mustard and honey. Line a baking pan with aluminum foil. Place racks of lamb in pan, brush with honey mustard. Sprinkle with salt and pepper. Press nut mixture on top of lamb. Drizzle with an additional tablespoon of honey. Roast for about 30 minutes until medium rare. Remove lamb from oven. Let stand 10 minutes. Discover how easy and delicious cooking with honey can be! 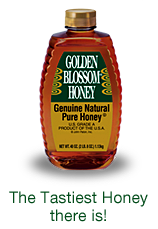 GOLDEN BLOSSOM HONEY adds just the right amount of flavor and moisture to a wide assortment of delicious recipes. Our test kitchen has perfected hundreds of honey recipes over the years. Now we've selected our all time-favorite honey recipes to share with you! We're certain they'll soon become family favorites. Golden Blossom Honey. The tastiest honey there is!